Here is the third and final part of Fr. Chad's address to the Serbian Clergy about how we should look at the ministry of the priesthood in today's society. Click to listen to this podcast now. The appointment of Deacons in the church is the subject of today's sermon by Deacon Emmanuel Kahn. Very Rev. 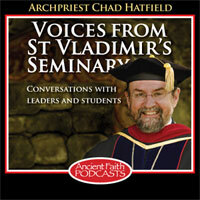 Dr. Chad Hatfield: I want to welcome all of you to Voices From St. Vladimir’s. We from time to time have the privilege of interviewing one of our authors, a contributor to SVS Press, and today we have with us Fr. Lawrence Farley, a well-known author of many books, and he’s coming to us from St. Herman’s Church in Langley, British Columbia. Father, I am particularly interested in talking about the book that was published with SVS Press under the title of Feminism and Tradition: Quiet Reflections on Ordination and Communion. I would begin by actually asking: Why a book with a title like this one? Fr. Lawrence Farley: I guess I wrote the book and titled it Quiet Reflections on Ordination and Communion because there were a couple of the hot topics, namely, ordination and communion, the ordination of women to the presbyterate and the episcopate, and also to possible revival of the order of deaconess, and also the question of whether women may receive holy Communion during their menstrual periods, questions which were kind of hot-button controversial topics, and I thought they had been addressed lots before, but perhaps with more heat than light, and I thought these important questions needed to be looked at dispassionately and irenically; I thought that people were talking past one another a little bit, and I wanted to deal with the questions as calmly and as thoughtfully as they deserved. Fr. Chad: Well, one of the treasures of St. Vladimir’s Seminary is we don’t shy from so-called hot-button issues, so I think I would like to focus in particular on chapter five, of Feminism and Tradition: Quiet Reflections on Ordination and Communion, which is the chapter addressing deaconesses. Fr. Chad: I note among other works cited are two classics, being [Aimé-]Georges Martimort’s Deaconesses: An Historical Study published in 1982, and Manfred Hauke’s seminal book, Women in the Priesthood?, published in 1986. For those of you who are listening in on Ancient Faith Radio, I would strongly recommend both of these books if you’re curious and would like to know more about deaconesses, their status, what happened to them, and their biblical and historical place in the life of the Church. Although they’re both Roman Catholic authors, certainly their research is perfectly applicable to those of us who are Orthodox Christians. So chapter five is, I think, very timely. Once again, we’re hearing a call for the, well, I guess we would call it the revival of the deaconess. Would you say something to our listeners about deaconesses in the early Church and the biblical evidence? St. Paul describes himself as diakonos in Colossians 1:25. In fact, in Romans 15:8, he describes Christ as a diakonos or a servant of God. So usually it just simply means “servant.” It can mean, and the office-holder of servant, kind of an institutionalized servant in the form of a deacon, you only find that pretty much in Philippians and in the pastoral epistles. I would suggest that in this particular instance, when it talks about Phoebe as a diakonos, since she’s also referred to as a prostatis, a helper or patroness, she was a servant of the Church, not in the sense of being an office-holder within the Church, but of a patron and sponsor of the Church; it was important in the sense that she was at Cenchreae, which is to say, lots of people came and went at her doorstep, essentially, and I think she was one of the people that gave financial and moral support to the Church, and that’s why St. Paul commends her, because everybody would have known about Phoebe. The problem with saying that she was an office-holder in the Church is that you don’t hear about the office of deaconess for the next two hundred years. In the writings of the Church Fathers in the first and second century, you hear lots about presbyters and bishops and deacons and subdeacons and widows, virgins; you hear nothing about deaconesses, and it’s a little odd if the office of deaconesses in fact was of apostolic provenance. If it was in the first century, one wonders why it disappears without a trace as soon as you close the pages of the New Testament, only to reappear in the third century. I would suggest, therefore, that this indicates that it was, in fact, not of apostolic provenance, that Phoebe was not a deaconess; she was a servant of the Church. It wasn’t a creation of the apostles that disappeared inexplicably for the next couple of hundred years. It was never in the New Testament times; it was a creation of the Church in the third century. ...needs to manage his own household well, keeping his children submissive and respectful in every way. (St. Paul says:) For a man who does not know how to manage his own household, how can he care for God’s Church? In the same way, when it talks about deacons, I would suggest that when it talks about the women, it’s not talking about women deacons, but again, the domestic qualifications for the deacons as well. In the same way, the wives of the deacons, he says, “must be serious and not slanderers, temperate, faithful in all things.” Significantly, St. Paul’s next statement is: “Let the deacons be the husband of one wife. Let them manage their own children and their households well.” So I think that it’s clear enough that even in its context in 1 Timothy that St. Paul is talking about not female deacons but the families of both the episkopos and the deacons. So not deaconesses, but deacons’ wives. Fr. Chad: That’s fascinating, particularly with the Greek text and how things are defined. But I wonder: How would you respond to Valerie Karras’s claim that, in early Christianity and the Byzantine Church, women were fully ordained and ranked as deacons? Fr. Lawrence: With respect, I would suggest that it’s anachronistic and maybe a little bit mischievous, historically speaking. There’s a couple of things that might be said about it. One is the question of fully ordained. You want to ask, “As opposed to half-ordained?” I think perhaps when she talks about “fully ordained,” perhaps what she means is that the modern distinction between ordination and blessing, cherotonia and cherothesia, and I think that the distinction between fully ordained and merely given a blessing, as a reader or a subdeacon or something like this is a modern distinction. I would suggest that it is alien to the mindset of the Fathers. They didn’t think of “fully ordained” or “merely blessed.” I think all people were set into their respective ministries with prayer and kind of canonically placed in there, asking that God would give them the Holy Spirit to fulfill whatever ministry they were entrusted with. So whether it’s ordination or not, they would say, well, it’s a ministry; it’s work in the Church of God; it will have its reward from God on the last day. When you look at the actual services for the ordinations of deaconesses and deacons, there are lots of similarities, but there are lots of significant differences as well. The prayer with which they are ordained, for example, is a different prayer. When the deacons are ordained at the altar, they kneel one knee. The priests would kneel on both knees; deacons would kneel on one knee, and place their head upon the altar. The deaconesses, however, when they are ordained, do not kneel on one knee nor place their head on the altar; they stand beside the altar with their head inclined and bowed. Similarly, when the deacon is ordained, he is given the chalice and expected to use it to administer the blood of Christ in the holy Communion. The deaconess is given the chalice, but returns it immediately. It’s apparent that the two ministries were real ministries, both of them; they were both real ordained ministries, to use a later, somewhat anachronistic term, I suppose, but they were very, very different ministries. The ministry of the deaconess was more gender-restricted; it was gender-specific. Their ministry was to the women; the deacons’ ministry was to the Church at large. So to say that deaconesses were just simply female deacons, I think is erroneous. They were both fully ordained, but deacons are ordained and priests are ordained: they’re both equally ordained, but they’re different orders. In the same way, a deacon and a deaconess were both “fully ordained,” if you like, but they were, again, different orders. It’s important to recognize the difference in the orders back then, and not trying to pretend that a deacon is a deacon is a deacon, you can be male or female but it’s the same order. No, they are radically different orders. Fr. Chad: That’s very similar to what Martimort, in his classic book, notes that a deaconess in the Byzantine rite was “in no wise a female deacon. She exercised a totally different ministry from that of a deacon. So with this fact established, I really must ask, Fr. Lawrence: What then happened to deaconesses in the early Church? Fr. Lawrence: They fulfilled their ministry, which was essentially a liturgical ministry, and to a certain degree a pastoral ministry to the women, and when that need was no longer there, it simply died out, because the point of any ministry is to meet need among the people of God. When that need was no longer there, the ministry simply died out; it became kind of an honorific title. Like the title archpriest, if I may say, it is an honorific title, possessing no actual significance, to be blunt. It’s the same way. The title deaconess had become monasticized, it was used as an honorific, but it no longer had the same function, so it was allowed to mercifully die out, because there was no reason to have a deaconess. In the early Church, deaconesses were used to administer baptism to the women candidates—of course, everybody was baptized naked in “them there” days, and someone needed to apply the oil of exorcism, the pre-baptismal anointing oil, on the bodies of the naked female candidates. Obviously you would get a woman for that particular task, and that would be the job of the deaconess. Similarly, if you’re going to go visit a sick person and care for them and bathe them, if you’re going to do that with a woman, you would send a woman to do that; that would be the task of the deaconess. But I suspect their main task in the early Church was assisting in baptism. Once again, when the baptism of adult candidates increasingly gave way to the baptism of infants, you didn’t need to send a woman down into the water with the naked female candidate, because babies were baptized, and if you have a naked baby, nobody cares. So the pastoral, liturgical function for which the office was established in the third century no longer was there, and it was allowed to simply lapse. Fr. Chad: That’s a fascinating historical fact, and it actually makes great sense as to why they just seemed to disappear. For those of you who are listening in and are beginning to want to know more about this particular topic, once again we’re recommending the book Feminism and Tradition: Quiet Reflections on Ordination and Communion, available through SVS Press, either calling the bookstore or you might order online. Fr. Lawrence, to sort of continue this conversation in a slightly different vein, because we’ve been talking about the call within Orthodoxy for the revival of the order of deaconesses, I would say that both of us know, from our past, of the good work that was done by the order of deaconesses in the Anglican tradition, an actual order of women who were doing, I think, true diaconal work, true diakonia. They disappeared with the declaration that Anglican deaconesses were deacons: everyone was a deacon, just like men. It happened kind of by fiat, decree; this happened in the early 1970s, as the feminist movement was gaining traction towards the ordination of women as priests and bishops in the Anglican tradition. And we know the fruit of that particular movement, and that is, of course, the ongoing division and sharp decline in membership in the Episcopal Church, the Anglican Church in Canada, and, indeed, the Church of England. All of this is well-known, so one has to ask: Is this sort of part and parcel? Is this the direction that people are calling the Orthodox Church to now move towards? Fr. Lawrence: That’s the real question, and I think that the Anglicans, in declaring deaconesses to be not just deaconesses but deacons, I think they weren’t motivated so much by historical considerations but by the fact that they want to ordain women to the orders of priest and bishop, and this is the thin edge of the wedge that was going to do it. So it had less to do with sound scholarship and a sober view of the historical facts, and more to do with a political agenda. I think that they might be forgiven, because I imagine that they thought that if they opened the office of deacon and priest and bishop up to women, the church would be revitalized and people would come flooding into the church and it would be just a wonderful thing… As you correctly say, that has not quite been the case for them. They might be forgiven that, because they did not have a crystal ball to see the future. We, however, don’t need a crystal ball; we can just look over the fence and see what’s happened to Anglicans, to Lutherans, and the traditions which have departed from the apostolic norms, and embraced, I would suggest, a liberal secular view of gender into the church. So I think that we should resist this, and especially because the reason for creating the office of deaconesses in the early Church in the third century to begin with was because they were pastorally required. The creation of the office was because the Church wanted to meet an actual felt need. I would suggest that there is no such actual felt need that requires an ordained office. I think if one wants to restore the office of deaconess, this has more to do with giving the women something to do, and advancing the cause of women’s ordination to the presbyterate and the episcopate, starting with the revival of the office of deaconess as more to do with the feminist agenda and less to do with meeting of actual need. I would suggest that if one wants to restore the office of deaconess, one should be honest and candid and say: this has nothing to do with advancing and restoring something from the third century; this has everything to do with the acceptance of the modern 21st century feminist agenda, which is to say, if you want to ordain women to the presbyterate or the episcopate, just do it, but don’t kind of slide it in bit by piece. It’s apparent when you look at the Anglicans then and the Orthodox now that the barrier for most of the laity, like why women were not accepted as priests and bishops in the ‘50s and the ‘60s in the Anglican Church wasn’t because the laity could read Church history, read for lots and lots and lots of it, or that they had all of these theological concerns; it was an emotional question for them. I would suggest that the Anglicans in the ‘50s and the ‘60s largely would not countenance women in the priesthood and the episcopate simply because the sight of a woman in a collar and standing in the altar, vested, was an unfamiliar sight, but once it became a familiar sight, because of having women deacons, then that sole barrier had in fact been overcome. I think the same will be true for us. If the Orthodox Church wants to ordain women deaconesses, and call them deacons and vest them and put them in the altar, this will, within a generation, overcome the sole remaining barrier to women’s ordination to the presbyterate and the episcopate. Then Orthodoxy can experience for itself the same dramatic decline that our Anglican neighbors have experienced. I think that therefore it would be utterly disastrous in the next generation for us to ordain women deaconesses in our generation. We will become simply the Byzantine Episcopal Church. Fr. Chad: Fr. Lawrence, it’s no secret that there are rather large numbers of former Anglicans who are now members of various Orthodox churches, jurisdictions, and your comments certainly seem to indicate that our Anglican experience is actually a gift that we bring with us to Orthodoxy. We’ve had an experience that seems to have validity and definite parallels to the current issues that are being floated in Orthodox circles, calling for the ordination of women. As this issue continues to attract some attention, I expect that one will find that many of the former Anglicans who are now Orthodox will engage in the debate and, as I said, actually bring the gift of having gone through the experience once before. Having said that, what would you say to our Orthodox critics who say that the presence of so many former Anglicans in the Orthodox Church [is] keeping us from a “dialogue” on this topic? Fr. Lawrence: A couple of things. One is that it seems odd that in the Orthodox Church one’s experience of something should actually disqualify someone speaking to the issue and not qualify them. In every other institution or business, if you’ve had experience with something, that generally qualifies you to speak authoritatively; it doesn’t disqualify you to speak. But, secondly, the word “dialogue” is an interesting word. The word “dialogue” is one of these “nice” words, it’s a good word, like apple pie and motherhood and patriotism and stuff like that. Everybody likes dialogue; nobody’s going to say: no dialogue. But under the heading of “dialogue,” which usually happens is capitulation. Dialogue—real, true dialogue—is the dialogue between two people in order to discuss an essentially open topic in order to reach some sort of discovery of truth and resolution. You don’t dialogue about absolutely everything. It would be illegitimate for the Orthodox to say, “Let’s dialogue with Unitarians because maybe this is an open question. Maybe Jesus isn’t divine after all. Let’s consider this to be an open question.” Or, “Let’s have a dialogue with those who are going to say that abortion is okay, because maybe, despite the fact that it’s been a closed question for two millennia in the Christian Church, maybe we can have a dialogue about it.” One can talk to those that believe that abortion is okay, but I’m not sure that I would call it a “dialogue.” I would call it a sharing of the Church’s position of the Christian truth. If by “dialogue,” you mean treating a closed question like an open question, then it’s not “dialogue”: it’s capitulation. So I think that if one wants to have a dialogue about this, one can, but we are talking about what is essentially a decided question, a closed question: the question about whether or not women should be ordained to the presbyterate or the episcopate is for the Orthodox, not an open question, any more than the divinity of Christ or the legitimacy of icons or the morality of abortion are open questions. We can, of course, talk, but we’re not talking to discover the truth. We have the apostolic truth. Our task is to calmly share what the apostolic truth is, to convince others that this is, in fact, the truth. We’re not talking to discover the truth; we have the truth already from the Scriptures and the Fathers. Fr. Chad: Fr. Lawrence, your new bishop, Bishop Irénée, recently enthroned as the bishop of Ottawa and Canada, in writing the foreword to your book, closed with these words, and I actually would like to read them and share them with those who are listening in. I pray that Fr. Lawrence’s contribution to the ongoing discussions on the role of feminism and tradition may be a step to a better understanding by our Western friends of the apostolic faith as preserved by the Orthodox Church of the seven ecumenical councils. I think that this is a book which not only is informing our Western friends of the apostolic faith, which you have so beautifully articulated, is our treasure, but this is a reminder to those of us who are part of the Eastern Orthodox tradition that we have this, and we need to better articulate our particular positions on ordination and marriage and other hot-button topics. One of the criticisms I hear from some of my non-Orthodox friends is that not enough Orthodox Christians are writing and publishing books on these topics to put forth an Orthodox position. We thank you for taking the time to produce Feminism and Tradition: Quiet Reflections on Ordination and Communion, and we look forward at SVS Press to further work with you on the publication of further books. Thank you for your time, Father. Fr. Lawrence: Thank you. You’re very welcome. God bless you.